The notion of what constitutes genius and what doesn’t is a focal point of culture. 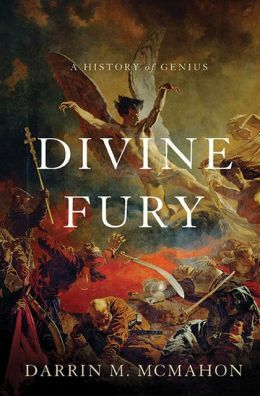 In Divine Fury: A History of Genius, acclaimed historian Darrin M. McMahon traces the history of genius “from the ancient world to the present day.” Along the way, McMahon points us towards fascinating individuals who helped bring the idea of genius to life. GENIUS. SAY THE WORD OUT LOUD. Even today, more than 2,000 years after its first recorded use by the Roman author Plautus, it continues to resonate with power and allure. The power to create. The power to divine the secrets of the universe. The power to destroy. With its hints of madness and eccentricity, sexual prowess and protean possibility, genius remains a mysterious force, bestowing on those who would assume it superhuman abilities and godlike powers. Genius, conferring privileged access to the hidden workings of the world. Genius, binding us still to the last vestiges of the divine. A long-range history in ideas is particularly well-suited to teasing out genius’s intimate connection to the divine, a connection that few serious analysts of the subject have explored. On the one hand, natural and social scientists since the nineteenth century have attempted to unlock genius’s secrets, to understand its nature and develop its nurture, probing the conditions that might bring it about. But in their relentless efforts to identify the many attributes of genius—and then to quantify and compare them—these researchers have tended to dismiss genius’s religious reception and appeal as so much superstition. A very different group of scholars, on the other hand, working in the fields of literary theory, art history, and criticism, has been inclined to reject the notion of genius altogether, toppling it from the privileged place it once held as an arbiter of aesthetic distinction. Genius and geniuses, they have argued, are myths that should be deconstructed and then dismissed, like so many ideological relics from the past. The impetus behind this work was certainly instructive— for the notion of genius, like many religious notions, has undoubtedly served a mythic role. But to simply write it off as an outmoded aesthetic ideal or a vestige from the days when history was concocted as the story of great men is to miss much that is interesting in this potent force. Finally, a third group of scholars, far from dismissing the religious appeal of genius, has embraced it. Writing in the 1930s, the American popular historian Will Durant noted that “in an age that would level everything and reverence nothing,” the worship of genius was the “final religion,” demanding obeisance, not critique. “When genius stands in our presence,” Durant declared, “we can only bow down before it as an act of God, a continuance of creation.” More recently, if no less reverently, the well-known critic Harold Bloom has imagined geniuses as Kabbalistic representations of God. God. “We need genius, however envious or uncomfortable it makes many among us,” Bloom affirmed. “Our desire for the transcendental and the extraordinary seems part of our common heritage, and abandons us slowly, and never completely.” Bloom is right about the stubborn desire for transcendence; it will draw close attention in this book. But rather than reproduce the religion of genius, or treat it as a myth that merits only dismissal, the phenomenon must first be understood on its own terms and explained. The making of a genius was a process akin to the “origination of a god,” a process of “deification” in which human beings invested others with mysterious powers and then bowed before them in awe. It followed that genius was invariably a “relationship” between the many and the one, a relationship that had come into being for specific historical reasons and that would, Lange-Eichbaum ventured, disappear in time. At the present moment, however, the relationship to genius was one of “semi-religious dogmatism.” Therein lay the problem. Charged with supernatural authority and invested with mystery and power, the notion of genius was dangerous. To speak of Hitler as a genius may seem unsettling, even shocking. Revelations that the singer Michael Jackson did so several years ago provoked an international outcry. But whatever the warped musings of the late pop star, to describe Hitler as a genius here is not to condone his actions or character in any way, or even to comment on his abilities, such as they were. It is simply to call attention to the fact that the label was crucial to his rise to power and public cult. We are less familiar with the darker side of genius today. We tend to focus on the heroic version that brings to mind the good genius of Einstein. Historians, by and large, have abetted this triumph, showing themselves little inclined to think of genius in connection with a man like Hitler. Their reluctance is understandable. Yet if we wish to appreciate the role that genius has played in the modern world, we must recall the evil with the good, bearing in mind as we do so the uncomfortable thought that genius is ultimately the product of the hopes and longings of ordinary people. We are the ones who marvel and wonder, longing for the salvation genius might bring. We are the ones who pay homage and obeisance. In a very real sense, the creator of genius is us. It begins in classical Greece, when poets, philosophers, and statesmen first entertained the question of what makes the greatest men great, initiating a conversation that was continued by the Romans. What power did Socrates possess to make him the wisest of all men? What godlike force moved through Alexander or Julius Caesar as they leveled all before them? Why was the poet Homer able to sing like no other? What special something did these great-souled men possess? What special something possessed them? Christians took up these and related questions in a centuries-long rumination that continued into the early modern period, adapting the language of the ancients to suit their own image of the God-man Christ and the prophets and saints who struggled to imitate his perfection. Possessed by the Holy Spirit, or lifted up by the heavenly angels, the great-souled man might aspire to be perfect as God was perfect. But how could he be sure that an angel was not a demon; that the holy ghost was not a specter, sent by Satan, to tempt him, the way Satan tempted Faust, offering the key to all knowledge in return for one’s soul? How could one be sure that those seized by higher powers were not mad, their souls stirred by dark humors and melancholy fits? Well into the Renaissance, when men like Michelangelo and Leonardo da Vinci sought to render God’s beauty and reproduce the perfection of his creation, these remained vital questions. It is worth listening closely to the answers. For although there is no single notion of genius that coheres magically over time, there are coherent ways of imagining how the highest beings might appear and what a beautiful mind might entail. Those early imaginings were present at the modern genius’s birth, and they lend insight into what the genius in the nineteenth and twentieth centuries would become. The modern genius was born in the eighteenth century—conceived, in keeping with long-standing prejudices, almost exclusively as a man. There were precedents for this birth, stretching all the way back to antiquity. But that the birth itself occurred in the bright place of deliverance we call “the Enlightenment” is clear. There are two broad transformations that are key to McMahon’s understanding of the emergence of genius. The first has to do with religious change, and, more specifically, with what has been described as the “withdrawal of God,” along with the disavowal and dismissal of a range of spiritual companions—spirits and angels, prophets, apostles, and saints—who had long served human beings as guardians and mediators to the divine. That dismissal was by no means uniformly accepted. But the scale was nonetheless significant and the consequences profound. For not only did it leave men and women alone in the world with their Creator; it did so at the very moment that the Creator was appearing to many to be more distant, more remote, more withdrawn, and less likely to intervene in human affairs than he had been (or so it seemed) in earlier times. To reach the realm of the sacred, to get to God— if indeed he even existed, as an emboldened minority was inclined to wonder—was more difficult than ever before. A vast space opened up, and there were no longer helpers on hand to guide human beings across the way. It was in that space that the modern genius was conceived and born. Thus the genius bridged the gap between people and the gods. Geniuses pulled back the curtain of existence to reveal a universe that was richer, deeper, more extraordinary and terrible than previously imagined. The baffling beauty of space-time was no different in this respect from the sublime majesty of Byron’s poetry, Beethoven’s symphonies, or Poincaré’s theorems, as radiant as an Edison light bulb or the explosion of the atomic bomb. Genius was a flash of light, but its brilliance served to illuminate the dark mystery that surrounded and set it apart. Geniuses, then, were believed to possess rare and special powers: the power to create, redeem, and destroy; the power to penetrate the fabric of the universe; the power to see into the future, or to see into our souls. The second transformation key to understanding the modern conception of genius is sociopolitical, and rests on a foundation of the belief in human equality. Widely proclaimed on both sides of the Atlantic from the end of the seventeenth century, the view, as Thomas Jefferson put it famously in the Declaration of Independence, that “all men are created equal” could pass by the end of the eighteenth century as a self-evident truth. By the middle of the century that followed, it was being hailed by astute observers such as Alexis de Tocqueville as a “providential fact,” an unstoppable force that leveled all before it. And yet the assertion of equality was qualified and challenged from the start, with whole categories of human beings singled out as exceptions to the general rule. Historians have devoted close attention to these exceptions, showing how women, people of color, Jews, and others were systematically deprived of their rights in strategies of exclusion that aimed at denying some the inherent equality granted to others. But what have received less attention are the justifications used to elevate the few above the many, granting privileges and rights beyond the norm. Jefferson himself spoke of a “natural aristocracy,” composed of individuals of talent, creativity, and intelligence, that might replace the old aristocracy of birth and blood, and many in nineteenth-century Europe would conceive of artists in a similar fashion, as beings endowed by nature with special abilities and so entitled to special privileges. Such assertions were often linked to corresponding claims of the natural inferiority of others, and together these notions formed part of a “shadow language of inequality” that accompanied the bright proclamation of the equality of all. Modern discussions of genius were most often conducted in this idiom, serving to justify new forms of hierarchy while registering a profound protest against doctrines of universal equality. Conceived as an extreme case of inherent superiority and natural difference, the genius was imagined as an exception of the most exalted or terrible kind, able to transcend or subvert the law, and to liberate or enslave accordingly. Today we often confuse the notion of genius and celebrity. [G]enius is seemingly everywhere today, hailed in our newspapers and glossy magazines, extolled in our television profiles and Internet chatter. Replete with publicists, hashtags, and “buzz,” genius is now consumed by a celebrity culture that draws few distinctions between a genius for fashion, a genius for business, and a genius for anything else. If the “problem of genius” of yesteryear was how to know and how to find it, “our genius problem” today is that it is impossible to avoid. Genius remains a relationship, but our relationship to it has changed. All might have their fifteen minutes of genius. All might be geniuses now. [Yet] a world in which all might aspire to genius is a world in which the genius as a sacred exception can no longer exist. Einstein, the “genius of geniuses,” was the last of the titans. The age of the genius is gone. Should citizens of democracies mourn this passing or rejoice? Probably a bit of both. The genius is dead: long live the genius of humanity. Divine Fury: A History of Genius is a wholly fascinating account of how the modern emergence of genius came to be.